The three eagles have landed ― in a golf course in Jersey City. 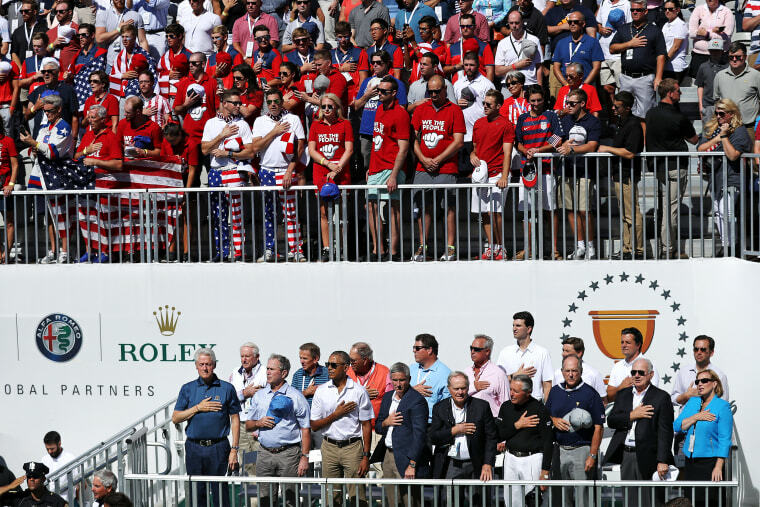 Former Presidents Barack Obama, George W. Bush and Bill Clinton attended the Presidents Cup Thursday in an extra special opening ceremony. Since the golf tournament began in 1994, this is the first time three U.S. presidents have attended the matches together, according to the Associated Press. The crowds packed into the grandstands weren't the only ones excited about the visitors. Even the ever steady pro golfers were eager for the chance to see the trio. Phil Mickelson caught them early and ensured he was the first golfer to get a presidential selfie. While Clinton has been the only sitting president to attend the matches in the past, that may change this weekend. President Donald Trump has not confirmed he will attend, but the PGA Tour is preparing for a possible visit from the current commander in chief on Sunday, the Associated Press reported. Obama, after shaking dozens of hands and having a long chat with United States assistant captain Tiger Woods, left after the third match started, but Bush and Clinton stayed until the end.